You can set a Sensitivity level on your messages to help recipients know your intentions when sending a message. However, the Sensitivity level doesn't stop recipients from taking any actions on a message. People receiving your email can take any action on the message that they want to, such as forwarding a confidential message to another person. To restrict actions recipients can take on the messages you send, we recommend you use Office 365 Message Encryption or Information Rights Management (IRM) if available in your organization. From your draft email message, click File > Properties. Under Settings, in the Sensitivity list, choose Normal, Personal, Private, or Confidential. Click Close. When you're done composing your email, click Send. For Normal, no sensitivity level is assigned to the message. Therefore, no text is displayed in the InfoBar. For Private, the recipient will see Please treat this as Private in the InfoBar. For Personal, the recipient will see Please treat this as Personal in the InfoBar. For Confidential, the recipient will see Please treat this as Confidential in the InfoBar. 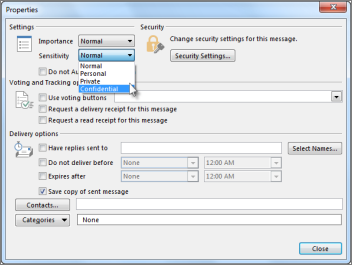 Under Send messages, in the Default Sensitivity level list, click Normal, Personal, Private, or Confidential. To restrict what recipients can do with a message you send, you have to use Information Rights Management (IRM). Your system administrator has to install IRM before you can apply restrictions to an email. If you don’t see the Permission button (on the Options tab), IRM probably isn’t set up. 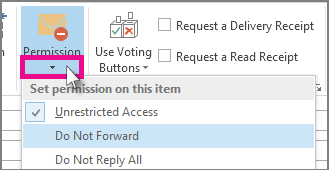 Important: You can view IRM-protected mail using Outlook 2013 RT, but you can’t send. Want to see what version of Office you're using? In your email, on the Options tab, click Permission. Important: IRM can’t prevent content from being erased, stolen, corrupted, or captured and transmitted by malicious programs or computer viruses. It also can’t stop people from writing the content out by hand, retyping it, or taking a digital photograph or screen capture of the message. Outlook has a variety of other permission settings to choose from. To see the list, click the arrow below the Permission button.